Comments Oh wow! 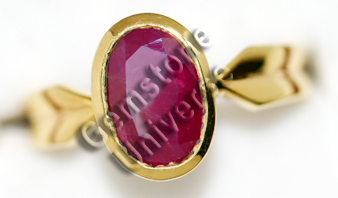 Lovely and Royal unheated Ruby that showed its full sparking beauty once it was set in the gold ring. It is our pleasure that one of our patrons would be a proud owner of this rare unheated Ruby. This is a prized possession since 99% of rubies in the market are heated or glass filled! No Heat, no thermal diffusion, no filling. Fully Natural Beauty. Massive size for a fully unheated Ruby with no treatment.